Sometimes when walking through the old Chinatown area of Bangkok you can stroll by an immaculately clean tiny restaurant or vendor cart selling the most aromatic soup you've ever experienced. A unique combination of natural spices and meat, served as a delicious soup you think can't be made in your own home. Whether you're an adventurous home chef or own a restaurant, you really should try this incredibly tasty soup mix. Made with a perfect blend of spices, including Sichuan peppercorns which add an explosion of citrus/pepper. You're friends will never forget the soup, or your customers will ask for it again and again. Instructions: Add 1 tablespoon Chinese-style soup seasoning mix to 20 cups of water. Bring to a boil. Add slices of meat, stew until tender. Add sugar, salt, black soy sauce to taste. Serve with noodles or rice. Garnish with chopped corriander leaves, garlic oil, and Thai pepper powder. White peppercorn, corriander root, and chinese tapioca root can be added while stewing (optional). 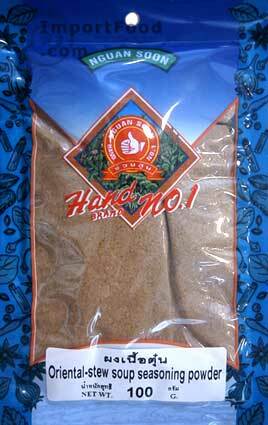 Made by premium Thai spice company Hand Brand. Ingredients: cinnamon, star anise, sichuan pepper, nutmeg, mixed spices, salt, pepper. All natural, no artificial ingredients or preservatives. Product of Thailand. Made in Thailand of the highest quality 100% hand-carved solid granite, this durable mortar and pestle is an important tool for Thai cooking as well as around the world. We source the raw material from the finest granite quarry, ready to pound your favorite barbecue rub this summer. The granite darkens into a nice, beautiful charcoal grey (at left is a new set which darkens over time due to oils in your food). This is not only the most functional tool in your kitchen but also a striking work of art. What sets it apart from others is the generous capacity, the beautiful appearance, and you can whack it as hard as you can without fear of chip or crack. You'll know when you pick it up that it will last a lifetime--they're very heavy and solid. The mortar is carved from a single block of grante. Our special promotion price is for the 6" size which is our smallest but still, provides all the capacity you need to pound up the finest barbecue rubs. Also infuse fresh ground flavors of basil, sage, tarragon, garlic, pepper and much more. 6" has 1.5 cup capacity, weighs 7 lbs. 4 1/2" inner bowl, 4" height. 6" pestle. These mortars are heavy, well balanced and suitable for rigorous pounding & grinding. If you ever see the way TV chef Jamie Oliver uses his, you'll know that this mortar and pestle and take a beating without fear of breakage. The nice weight and taper of the pestle assists you. When using the mortar and pestle, it's a good idea to place a folded dish towel down on the counter first, as the heavy mortar can damage your countertop. When finished, simply place mortar and pestle in the sink and rinse it with soap & warm water. As Thai culture has lots of old "legends" and superstitions handed down through generations, there is an old wives tale about the stone mortar and pestle that we'd like to share. Although you can really pound the pestle as hard as you can, it should always be done with food in the mortar. If a woman pounds the pestle into an empty mortar, Thai superstition has it that her breasts will stretch to the ground. See: Other Sizes Of Our Granite Mortar and Pestle. We are having this manufactured for us in Thailand using the finest stone and workmanship. This is a tremendous value.